If I had a quarter for every time I heard a professor emphasize the importance of college student internships, I’d probably be a millionaire by now (ok, maybe a slight exaggeration, but I know I heard it A LOT before I graduated). It makes sense – companies want to hire new graduates who have at least some experience in the field rather than simply feeding them to the wolves. That’s why you see so many programs requiring that college students complete an internship prior to graduating nowadays. Although these specific courses provide guidance and resources for finding internship placements, you will most likely be responsible for doing at least some of the legwork. 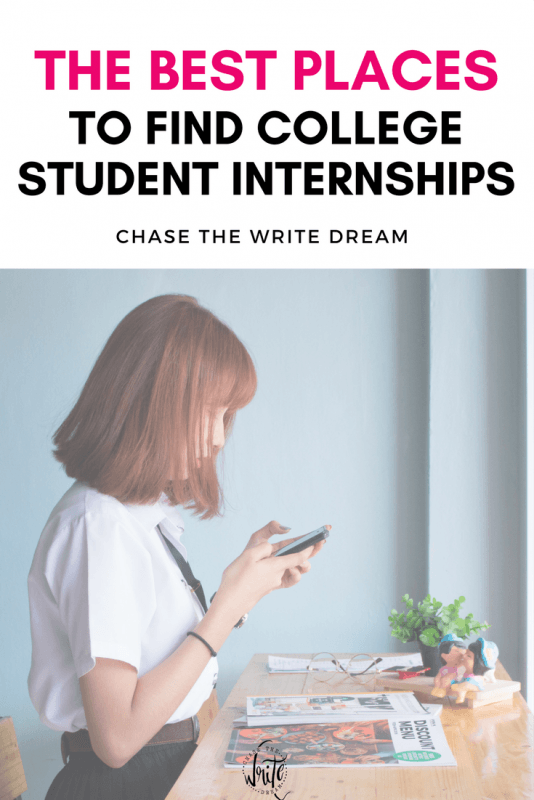 That’s why I wanted to write this article – so that you knew where to find the best lists of available college student internships. Almost every college or university has a career center that is chalk full of resources ranging from interest assessments to job postings. If you’ve never stepped foot in this office, there is no better time than the present! Your career services office should have a list of all the various jobs, internships, and volunteer opportunities that are available to college students. You may even be able to access this form online through your school’s website! Depending on how large the list is, you may be able to filter according to college major, year in school (i.e. freshman, sophomore, etc. ), location, and employment type. You may notice an influx of college student internships being offered in the summertime since most students are off during this season, or they are taking a much lighter course load. If you honestly have no idea where to start in the process, schedule an appointment to talk with one of the career services advisors on staff to discuss your potential options. You may be asked to complete some personality assessments, interest inventories, and other questionnaires to find out where your skills best match up. If you’re interested in interning for a certain company, head on over to their website and look for a Careers page. Oftentimes, companies will list their available internships right where the available jobs are. Keep in mind that some companies only hire interns during certain times of year (summer, spring, fall, etc. ), and they may ask that your application be submitted well in advance of that timeframe. If you are a social work (or related) major, have an interest in working for nonprofits, or you simply want to make a difference in your community and the world, then Idealist is the perfect site for you. As a former human services worker, I spent a lot of time browsing through the postings on Idealist as a way to find new opportunities that I may not have heard of on a typical job board site, such as Indeed or CareerBuilder. I chose this site has one of the best places to find internships for college students because it is very user friendly and offers a good selection of opportunities across the country, and globe. I like how I can search the Idealist site and read about companies and organizations that I have never heard of before. Even if you aren’t interested in working for a nonprofit in the future, it could be a good learning experience for students from all types of majors. We’ve all heard that diversity on a resume is attractive, so make sure you look into every opportunity that is available! As social media continues to grow and pave the path for us like never before, more and more companies are jumping onto sites like LinkedIn to find their next big star. Rather than having to search down connections in-person, you can access the LinkedIn user database and find members to connect with through the site. This is a great way to introduce yourself to employers you may be interested in getting an internship with! Although I would advise against blowing up someone’s inbox, it doesn’t hurt to send a quick little note stating your interests and asking whether there are any internship openings for college students being offered. If the answer is no, at least you have a future connection to hang on to! The other reason I wanted to list LinkedIn is because it allows you to build a more robust resume than you normally would get to on paper. I can’t tell you how many times someone has told me to keep my resume to one page, but I always struggle with this because there is so much information that I feel is getting left out. Thankfully, LinkedIn gives me the opportunity to showcase not only my work experience, but also my skills, interests, and any other information I would like to include. As a college student who is looking for an internship, you may find that you don’t have as much work experience, but I’m sure that are a wide range of skills that would seem very attractive to potential employers. Make sure you utilize all of those extra spaces to really sell yourself! The site also gives you the ability to filter your search for internships only (just click here). A solid profile mixed with a job search feature that allows you to apply with your LinkedIn information could be a potential gold mine for you! Interested in working for a government organization? Want to learn more about the federal government itself? USAJOBS is the perfect site for you! Although you may be able to find some jobs in rural areas, you will probably notice that a majority of the internships offered for college students are available in more populated cities. If you don’t mind traveling or staying somewhere else for the duration of the internship, then you could potentially look at positions all over the country, but keep in mind that you will probably be responsible for relocation expenses. My biggest beef with USAJOBS is that not many positions are available. With that being said, if you are looking for a site that offers a lot of different options and postings, then USAJOBS probably shouldn’t be your first choice. On the other hand, if you are specifically interested in gaining experience in the government, then this is your best place to find internships for college students. This site offers one of the most comprehensive internship lists out there. If you are looking for a wide variety of opportunities and you don’t know where to start, then Internships.com is where you should go. The search feature on the homepage allows you to search my keyword and/or major, as well as location. Once your results are delivered, you can filter them even more by radius from the location you entered, company, full-time or part-time, and more! You can also filter for paid and unpaid internships, though keep in mind that a majority of the postings you will come across will probably be unpaid. I know no one likes to work for free, but the experiences you will take away will help you be more marketable in the future when you graduate, thus allowing you to gain an edge over your competitors. Why Should I Participate in College Student Internships? You may have some questions about internships and why professors talk about them so much. What it ultimately comes down to is the extra experience. Think about it – you are around 18-years-old when you enter college and the school asks you to declare a major. As you go through the courses, you begin to learn more about what interests you and what turns you off. Although the courses do a good job of presenting the material that you will need to know in your field, they don’t necessarily give you the hands-on experience that will allow you to see whether you truly like the job or not. That’s why the internships are there – so you can immerse yourself into the work and see if it’s the right fit for you. If at all possible, you should try to complete your first internship during or prior to your sophomore year so that you have time to decide whether your current major is the right fit for you. You may discover that you hate the work and want to change your plan. If you discover this early on in your college career, you should be able to switch without it severely impacting your projected graduation date. In fact, it may not change at all if you’ve only take a few basic courses and several general education classes. Remember, there are plenty of resources out there to help you through not only the internship process, but through college in general! Is a Human Services Degree Right for You?